J.D. Martinez was a poster child for the fly-ball revolution. But his approach and swing has continued to evolve. J.D. Martinez changed baseball hitting philosophy once. Maybe he’s playing a part in changing it again. Martinez was one of the original fly-ball revolutionaries. He was one of the first hitters to go against convention, possibly risking his career, by adopting an uppercut swing to try to hit for more power. Like many hitters, he was taught to use a flat, level swing. But he wondered more and more why his best swing, what coaches preached, resulted simply in singles up the middle. From 2011 to 2013, while with the Houston Astros, Martinez posted a .251 average, a .387 slugging mark and an 88 OPS+.1 He knew as a corner outfielder that his career was in jeopardy. After watching former teammate and fly-ball hitter Jason Castro, Martinez sought out a private swing instructor and transformed himself. He tried to convince Astros management that he had changed the following spring, but he was released in March 2014. You probably know the rest of the story. The Tigers picked up Martinez in 2014, and he immediately became a star. Prior to this season, the Boston Red Sox guaranteed him $110 million over five years even though he’s entering his early 30s, when most hitters are expected to begin to decline. But instead of showing his age, the 31-year-old Martinez rewarded the Red Sox with a .330/.402/.629 slash line, 43 homers and 130 RBIs, along with a career-best 173 OPS+. The Red Sox were so invested in Martinez’s style of hitting they even hired a like-minded hitting coach in Tim Hyers. Hyers and Martinez helped Mookie Betts take the next step in his development to become an undersized slugger and the American League’s best player. All of that has taken the Red Sox to just one win away from advancing to the AL Championship Series, with the Houston Astros waiting. Boston meets the New York Yankees in Game 4 of the ALDS Tuesday night. Martinez isn’t the same hitter that he was when he turned around his career in 2014. He keeps evolving. But that hole in Martinez’s swing is gone this season. 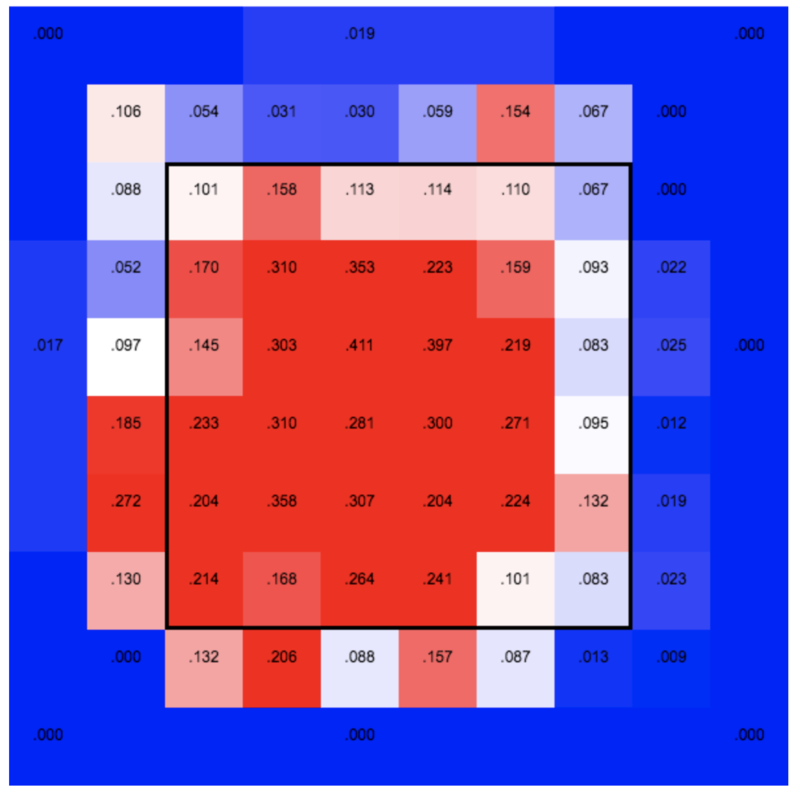 Martinez adjusted and raised his slugging percentage to .500 against fastballs in the upper third and above the zone in 2017 when he became aware of the counterpunch that pitchers were throwing at him with the four-seam spin. Martinez slugged .584 against fastballs in the same location this season. That’s not the only change Martinez has made. His pull percentage is also at its lowest level (at 37.7 percent) since he was an Astro in 2013. Out of 360 qualified hitters, Martinez ranked 268th this year despite playing in a home park with some of the most favorable left-field dimensions for a right-handed hitter. Perhaps with this approach, Martinez is also trying to combat defensive shifts. While 55.1 percent of ground balls were pulled this season, only 51.9 percent of Martinez’s grounders were hit to the pull side, ranking 252nd out of 340 hitters. 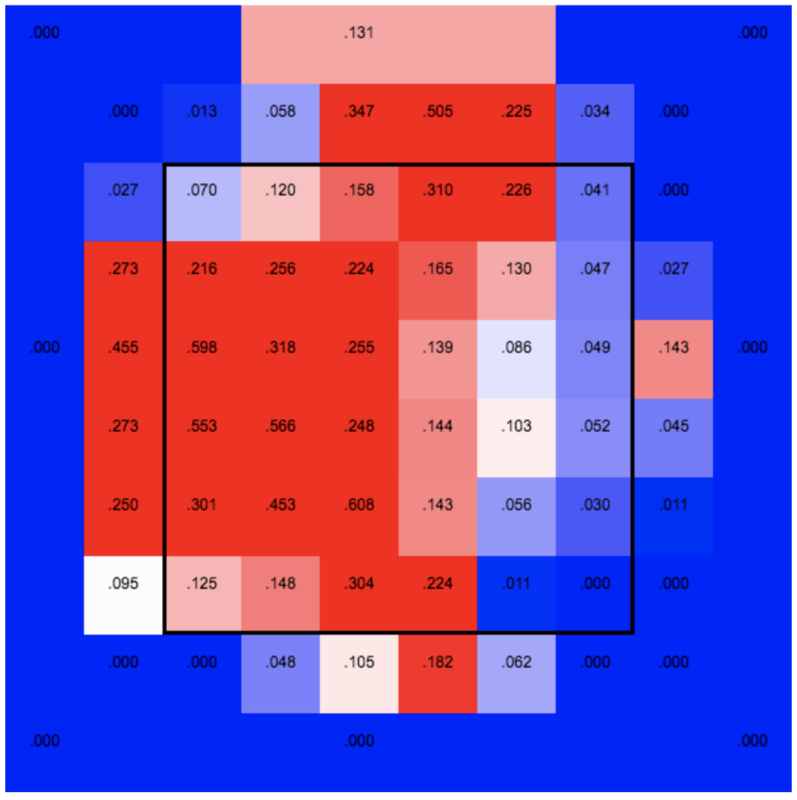 In each season from 2014 to 2017, Martinez hit at least 60.8 percent of ground balls to the left side. Also of note is that his ground-ball percentage (at 43.5 percent) is the highest since before his metamorphosis, speaking to a change in swing angle. Martinez dropped his average launch angle from 13.4 degrees in 2016 and 15.2 degrees in 2017 to 10.6 degrees this season. Though Martinez is spreading his batted balls around more on the ground now, he’s always had power to all fields in the air, where he still wants to drive the ball. He had the seventh-highest rate of air balls hit to the opposite field this season at 47.7 percent. Since that 2014 season, when he remade his swing, he has increased his opposite-field fly ball and line drive rate every year. But unlike many hitters, Martinez uses the opposite field for power. Martinez had the fourth highest home run-to-fly ball rate on balls hit to the opposite field this season. He hit .360 on balls to right field and slugged .919. But when he does pull the ball in the air, he’s even better. He hit .828 and slugged 1.813 on air balls he hit to the left side. At a time when so many complain about hitters not using the whole field, Martinez is doing just that. Though Martinez has made plenty of changes, he’s still squaring up pitches like few major league hitters. Statcast’s “barrels” per plate appearances metric, which evaluates the quality of a hitter’s contact using exit velocity of ball off bat and launch angle, has him near the top of the leaderboard again this season — as he has been since the measure was introduced in 2015. Over the past five years, Martinez has been at the vanguard of the sport’s trends. He may just be giving hitters a road map for adapting to an ever-changing game.